"Getting the Most out of vMotion - Architecture, Features, Debugging vMotion is a key, widely adopted technology which enables the live migration of virtual machines on the vSphere platform. It enables critical datacenter workflows, including automated load-balancing with DRS and DPS, hardware maintenance, and the permanent migration of workloads. Each vSphere release introduces new vMotion functionality, and significant performance improvements to address key customer requests and enable new use cases. In this session, join engineers from the development and performance teams to get an insiders' view of vMotion architecture, cutting edge features, best practices, and tools for performance troubleshooting. Performance studies will be presented for some of the hot topics including Monster VM migrations, migrations over IPv6, and Metro migrations over Distributed/Federated storage deployments. Finally, take a sneak-peek into the future and performance directions for vMotion including long distance migrations and migration to public clouds". Transperent move of VM to another host. 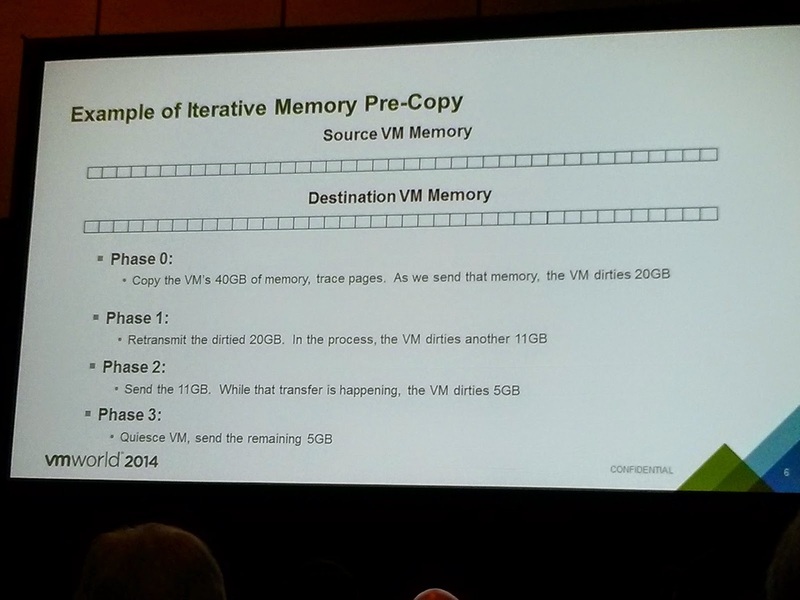 How does the memory copy work? Pretty complex. Uses iterative memory pre-copy. Cycle through memory pages, copy and monitor for changes (dirty pages). Repeat until converges on equality. Flip side of vMotion, only care about disk state. VM remains on same host. Moving VM atomically to another host without shared storage! 2 NICs shows significant benefit. 3rd NIC not so much (due to vMotion helper threads limitation).